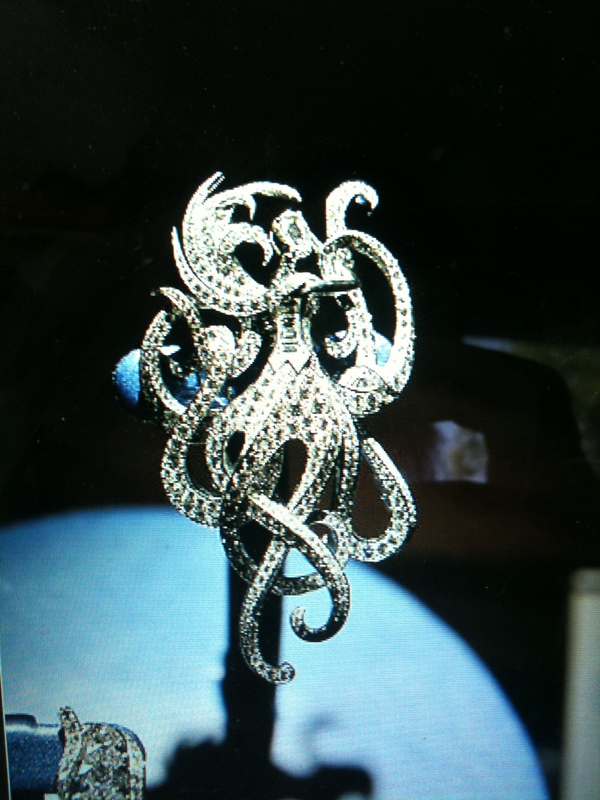 Much as the haute couture fashion shows, high jewelry seems to have rediscovered the art of storytelling. During last weeks’s couture season, every piece of jewelry had a story to tell. Van Cleef & Arpels retold us two extraordinary tales of a journey — “20,000 Leagues under the Sea” and “Five Weeks in a Balloon”, which were translated into the language of stones. The result was stunning. 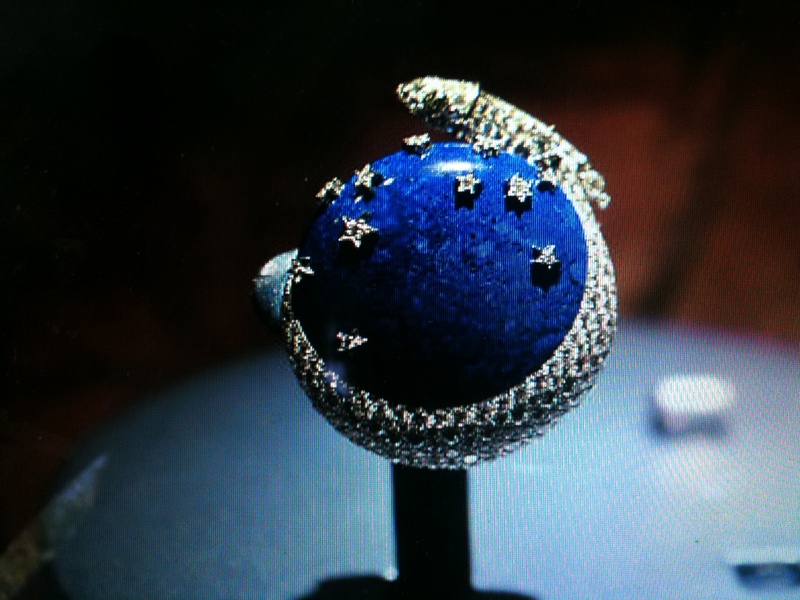 “Creating emotion from nature, playful pieces and living jewels,” said Stanislas de Quercize, the chief executive of Van Cleef, referring to a paradise where roses have no thorns, where a globular opal looks like the Earth viewed from space, and where a client can move a diamond rocket around a star-studded lapis lazuli sky. Van Cleef's diamond rocket around a star-studded lapis lazuli sky. Showing only 33 of the 100 pieces that will be on display at the 25th Paris Biennale des Antiquaires in mid-September, this Van Cleef collection still managed an impressive journey. It encompassed jewels suggesting the sinuous source of the Nile, glacier-blue chalcedony penguins, a whale spouting a diamond “spray” and diamond-encrusted polar bears. And the idea of revisiting the ideas of Jules Verne was imaginative, given that the Industrial Revolution that was shaking society a century ago is matched by today’s love/hate relationship with technology. The theme of nature — especially flowers — grew throughout the high jewelry collections. 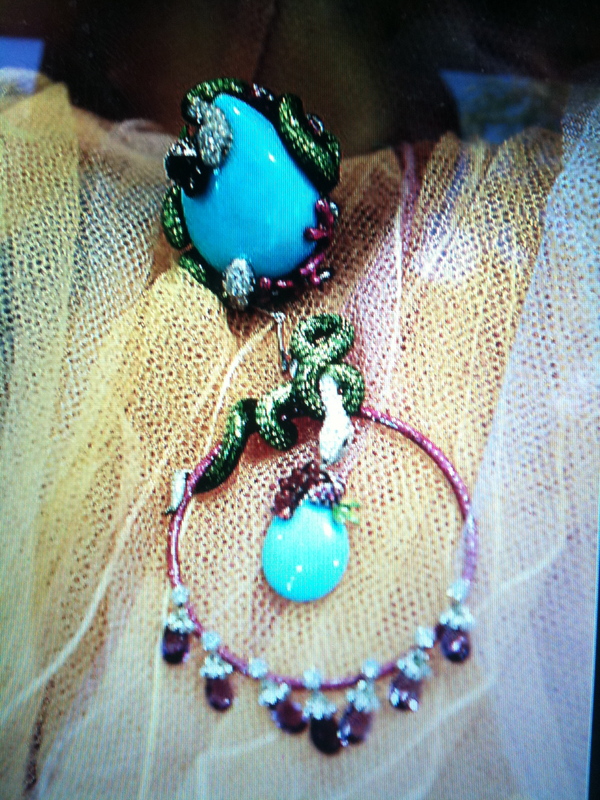 Dior's "Le Coffret de Victoire," where the fine gems mingled with semiprecious stones like a green opal. 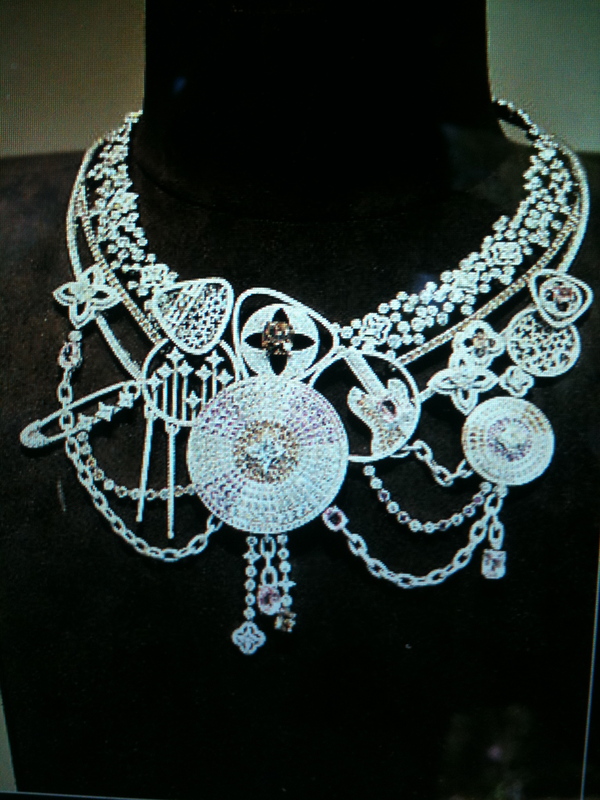 Boucheron seemed to want to lure us into their bejeweled french boudoir, where powder puffs laid out on cherry-red silk introduced ultra-feminine pieces, such as “Coquette Houpette,” or “Saucy Powder Puff,” — a pavé diamond necklace, its fluffy and feathery circles dotted with purple, pink and blue sapphires, and a “Stolen Kiss” parure, with diamond curls inset with lipstick-red and glossy-pink rubies and diamonds. Boucheron's "Coquette Houpette," or "Saucy Powder Puff"
Chanel’s inspiration was feather light — the diamond plume that Coco herself created in 1932. But as well as reworking the original fronds of diamonds into an articulated mix of brilliant- and princess-cut diamonds set in white gold, the collection flew off in new directions. 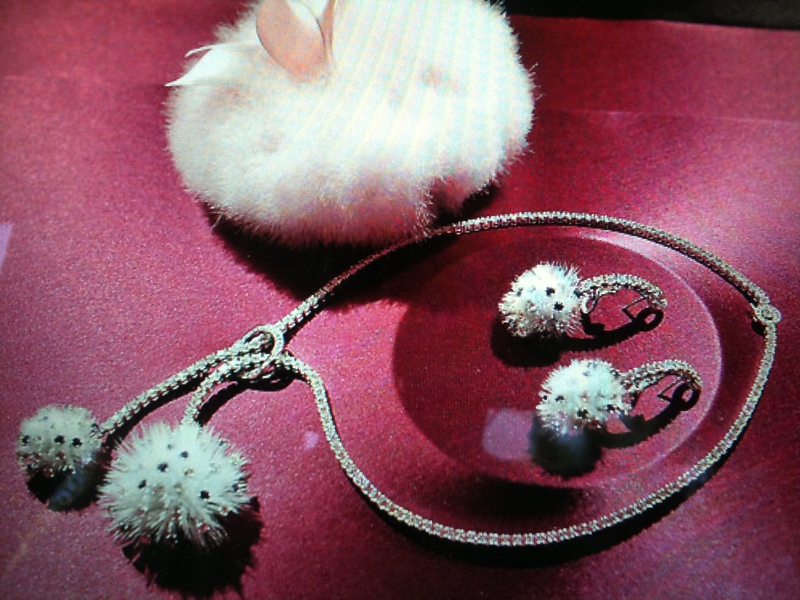 The jewels, set alongside bird cages, empty but for a fluffy white feather, were mainly in white diamonds with inserts of stones in soft shades like pale rose-colored, pear-shaped sapphires. 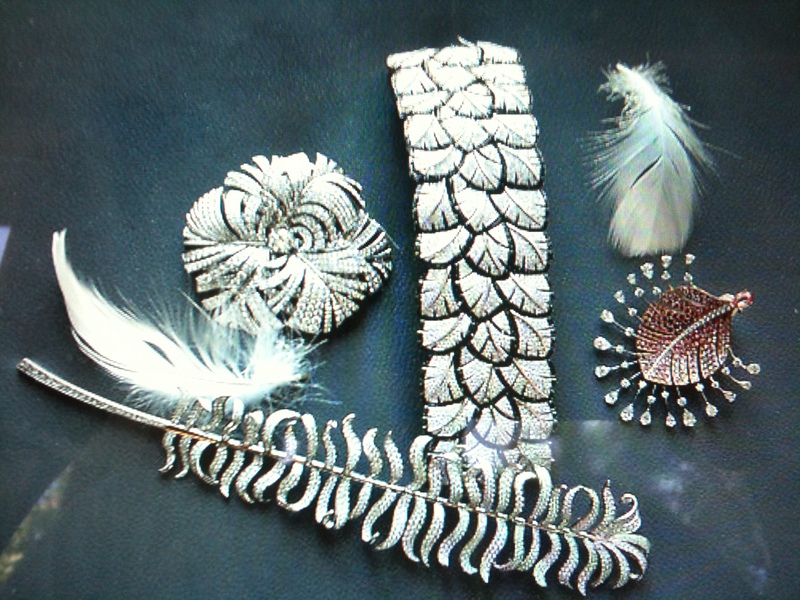 Chanel's jewels were set alongside bird cages, empty but for a fluffy white feather, and were mainly in white diamonds with inserts of stones in soft shades like pale rose-colored, pear-shaped sapphires. Travel is the soul of Louis Vuitton, but Lorenz Bäumer, the artistic director for high jewelry, gave something new to that concept and to Vuitton’s geometric toile patterns by envisaging flowers in exotic places. “I wanted to made them light and supple,” the designer said, referring to inspirations he took from Brazil and Tahiti, focusing on tropical flowers like the frangipani and on stones with a subtle palette, including watery aquamarine and chalcedony, or green shades of emerald and jade. The LV-cut diamonds and discreet inserts of the brand’s signature monogram flower were integrated into the six parures and 35 other pieces. “It must give an idea of movement,” said Pierre Rainero, the image, style and heritage director at Cartier, to describe the essence of a collection where the most noble necklace seemed to be have a dynamic form pushing it away from its central position. Imaginative works included a tiger with emerald eyes sculpted from fossilized wood, and the effect of a jeweled “fountain” spraying upward. The designer, referring to opals, said that he liked “different associations of color,” and he also worked an intricate floral theme by engraving flowers on sapphires. This entry was posted in Chanel, Dior, Fashion, Fine Jewelry, High Jewelry, Louis Vuitton, Paris Haute Couture, Red Carpet Jewelry, Van Cleef and Arpels and tagged Cartier, chanel, Dior, fashion, fine jewelry, high jewelry, Louis Vuitton, paris haute couture, Red Carpet Jewelry, Van Cleef and Arpels. Bookmark the permalink.